Lunch spots in downtown are a scene – crowded and expensive – and nary an innovative place in sight! Luckily, there is one little alley off the beaten path that is providing a rich addition to the business lunch scene….Enter Ritch Street, a tiny street off of South Park that houses some hidden gems for downtown noshing! At Townsend and Ritch you will find Little Skillet – the child of Farmer Brown’s restaurant on Turk street. 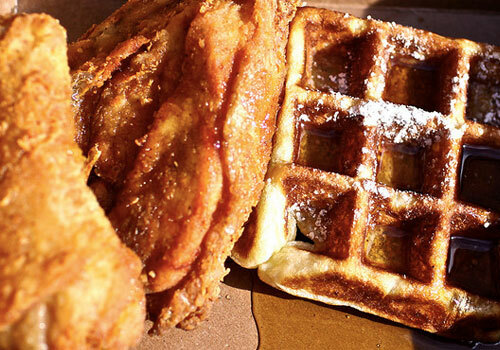 It’s hearty Southern cooking – like battered chicken and syrup drizzled waffles – that you will have to atone for at food police confessional! Still their recipe is original: their chicken is not coated in rice flour or buttermilk but rather just dunked in Giusto’s flour and coated in 20 spices and a salt-water brine for 24 hours… Leaving it crispy and light. For a take out kitchen window, Little Skillet has already received a lot of attention – ranking #4 in 7×7 magazine’s 100 Things to Eat+ Drink Before You Die. But, for a truly new spot, still undiscovered by the masses, one must walk just a bit further, towards Bryant Street. Below a wooden sign reading Darwin, is a simple and elegant cafe where the chef has a real zeal and love for artisan cooking! Named after the previous site occupants of Darwin Motors – the space is a South Park respite… with unpretentiously fresh and delicious ingredients and a carefully crafted menu (written on a hanging sheet of butcher paper). Open from 8am till 8pm, they have pastries and De La Paz coffee for breakfast, sandwitches on Acme bread from just $4.25 for lunch, and beers, roses and Spanish wines for after 5pm happy hours – when the menu changes to seasonal tapas – such as locally grown Shishito peppers, assortments of cheeses, green buttery Castelvetranos olives, meaty sardines, mussels & clams – all served in personal sized cast iron skillets. So…enjoy some skillets on Ritch street – a new dining destination that is worth its salt! Rendered in:0.0383 seconds with 7 queries, using 254 k / 462 k.